What are the key points in Donald Tusk's Brexit guidelines? From the rights of EU workers, to keeping the peace in Northern Ireland, here are some of the areas EU leaders will be discussing. 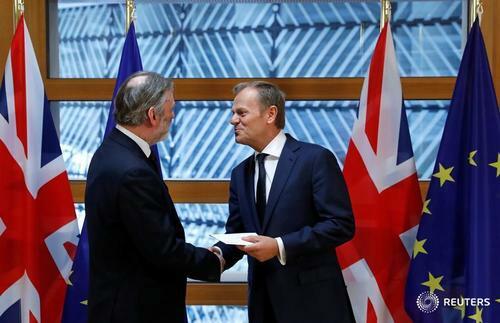 Earlier this week Donald Tusk accepted a letter from the UK's permanent representative in Brussels, Sir Tim Barrow, triggering Article 50 and starting the Brexit process. A discussion ensued about whether or not the letter had contained a veiled threat to EU leaders over security. Mr Tusk hopes that Europe's leaders will have agreed to negotiating terms by 29 April. If "sufficient progress" towards agreeing the terms of an "orderly withdrawal" on March 29, 2019, is made in a first phase of talks starting in early June, the EU27 could launch talks on how a long-term future free trade relationship could work, the draft says. That represents a compromise between the position of EU hardliners, who want no trade talks until the full Brexit deal is agreed, and British calls for an immediate start. 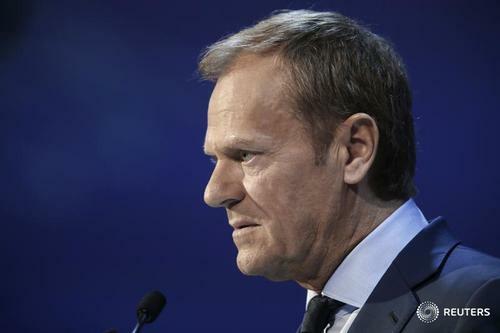 Tusk told reporters the EU could assess as early as this autumn if progress was "sufficient". But it is unclear how it will arrive at that judgment. If leaders need unanimity, some could block trade talks. Eastern states with many expats in Britain may want more certainty on their rights, while western powers are more keen on talking about trade. Britain could have a few years after March 2019 when it does not have to give up all benefits of membership, to ease the shift for people and businesses. But in that case it would have to accept EU rules, e.g. on free migration, and submit to supervision by the European Court of Justice and other EU authorities. "Any such transitional arrangements must be clearly defined, limited in time, and subject to effective enforcement mechanisms," the draft says. The EU 27 will stick together against British efforts to divide and conquer and is prepared to play hardball against Prime Minister Theresa May's threat to walk out without a deal. Brussels thinks Britain needs a deal more than the EU. "The Union will act as one. It will be constructive throughout and will strive to find an agreement. This is in the best interest of both sides. The Union will work hard to achieve that outcome, but it will prepare itself to be able to handle the situation also if the negotiations were to fail." Free trade will be a good outcome but Britain should not expect to get that if it seeks competitive advantages for its companies by state subsidies or by tearing up EU environmental or labour standards or setting itself up as a tax haven. "Any free trade agreement should be balanced, ambitious and wide-ranging. It cannot, however, amount to participation in the Single Market or parts thereof, as this would undermine its integrity and proper functioning. It must ensure a level playing field in terms of competition and state aid, and must encompass safeguards against unfair competitive advantages through, inter alia, fiscal, social and environmental dumping." Britain cannot have a better deal outside than inside the EU -- that would be a slippery slope to others leaving the Union. Tusk welcomes May's acknowledgement she cannot "cherry pick" single market membership without accepting freedom of movement for EU workers but warns against her suggestion that Brussels open technical talks on trade in specific sectors. "Preserving the integrity of the Single Market excludes participation based on a sector-by-sector approach. A non-member of the Union, that does not live up to the same obligations as a member, cannot have the same rights and enjoy the same benefits as a member." Britain must pay up on its share of potential losses from guarantees given by the EU, among other things. Until it leaves, the actual bill probably can't be calculated with accuracy. The main thing for the EU is to agree a "methodology" this year. "A single financial settlement should ensure that the Union and the United Kingdom both respect the obligations undertaken before the date of withdrawal. The settlement should cover all legal and budgetary commitments as well as liabilities, including contingent liabilities." The EU doesn't want to disturb peace in Northern Ireland, where there will be a new EU land border. It is also paying attention to British military bases in Cyprus and is giving Spain a special say on the fate of the British territory of Gibraltar, which is not part of the UK but is in the EU. "In view of the unique circumstances on the island of Ireland, flexible and imaginative solutions will be required, including with the aim of avoiding a hard border, while respecting the integrity of the Union legal order." Follow the Brexit process with us - bookmark our Road to Brexit live blog where you can catch up with daily updates.